For the high-tech panel manufacturing industry, robots are a fundamental tool to pick and place the heavy and fragile glass substrate. A world-renowned Taiwanese panel maker has six thousand robotic arms in more than ten factories across Taiwan to transfer and move materials, and the maintenance of robots occurred when failure happened or it was scheduled for its annual service. However, this approach is unable to determine the "health" status of the robot. Once an abnormal situation arises, it stops the production line or leads to insufficient production and late delivery. To address this, the company was looking for an equipment monitoring and early warning solution to immediately arrange the examination and repair when abnormality occurs, thereby optimizing robot utilization and lowering maintenance costs. 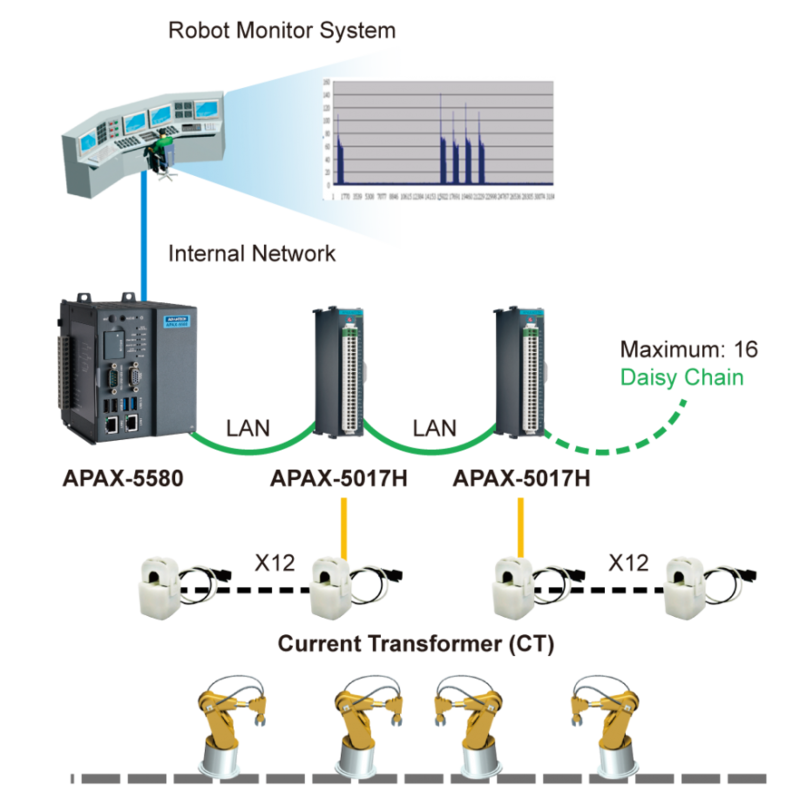 By using APAX-5000 series products (including PAC controller, analog input module and backplane module), Advantech designed a robot monitoring and preventative maintenance solution to meet the high-speed data acquisition needs. The APAX-5580 has an integrated Intel processor that not only provides highly efficient computing, but also gives the control platform the flexibility to integrate a variety ofI/O modules. Through the 12-channel APAX-5017H analog input module, , it connects the Current Transformer (CT) on the six-axis robotic arm, the APAX-5580 is able to temporarily store the collected analog signals on its internal hard drive. The monitoring system in the control room periodically extracts the industrial computer data via the factory intranet according to the user’s set time (every five or ten minutes), thereby gaining detailed current fluctuation data and then analyzing whether the robotic arm is abnormal. Advantech has years of experience in equipment monitoring and preventive maintenance, and has provided the relevant solutions for many semiconductor and high-tech manufacturers. Taking this panel maker as an example, it has already applied Advantech’s machine diagnosis and monitoring system in its factories, so the company also sought our assistance when it decided to implement the robot monitoring system. It is worth mentioning that the solution has accurately collected abnormal current signals during the project testing phase, and the robotic arm did not work after a few days, which made the company more firmly feel the necessity of introducing such a monitoring system. Furthermore, their approach to continue to use a robot until it is no longer serviceable will cost a great deal to replace. Compared to this, the early warning system enables users to spend less than 10 percent of the replacement costs on maintenance. Currently the company’s factory in Central Taiwan has adopted Advantech's solution to monitor more than 300 robotic arms, and the other factories will implement the same system to achieve.